Called Happy Cafe simply because we first nicknamed another bar on the street the Sad Cafe after the unsmiling staff, the Happy Cafe always satisfies! 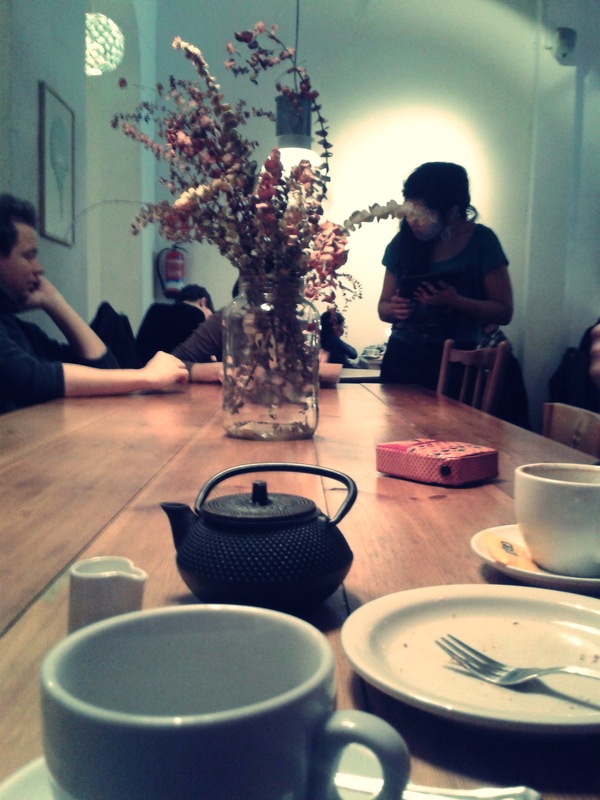 It’s called Bar Celona by the cheerful family which runs it. Walk in and shout hello to the three brothers who work the bar – a pair of ginger twins and a lovely older brother. You may also spot the hot blond aunty (T claims she is the aunty, I just don’t know) and the mother who runs the kitchen. On other days I have had Canneloni esk starters, raw fish marinated in lemon juice served with fresh vegetables, chunks of fish baked and served with a herb and tomato sauce and an array of meat and potato combinations. Each dish cooked and flavoured to perfection and served in belly filling proportions. Me: And the younger blond lady? Me: She’s not married to any of them? Me: Didn’t we see one of the younger guys with his hand on her bum once? T: …Its ok to feel your aunty’s bum?! I found it! Less than two weeks in my new barrio Barceloneta, I have found the perfect local bar. 1. Close to home. About 3 minutes walk around the corner. Its been more than a year since I last ate a dosa. Since I last sank my teeth into crunchy ghee soaked goodness dipped in cold tangy coconut chutney. Oh way too long. 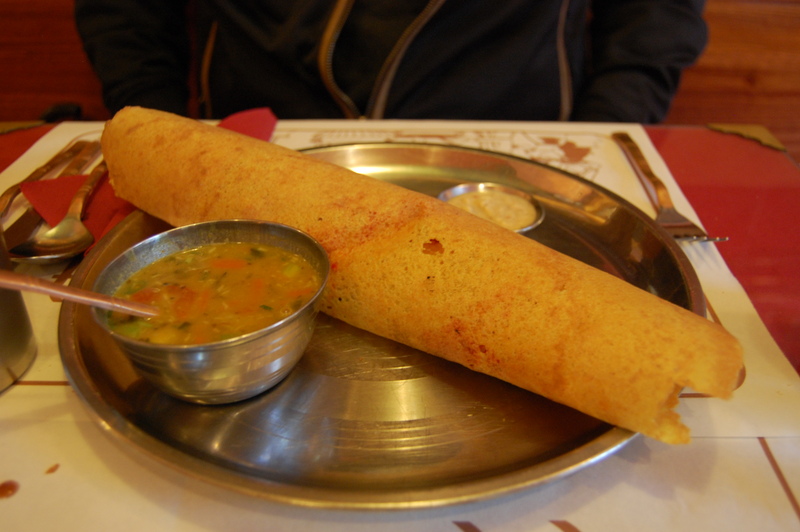 Dosas can be found in Barcelona, at a price. 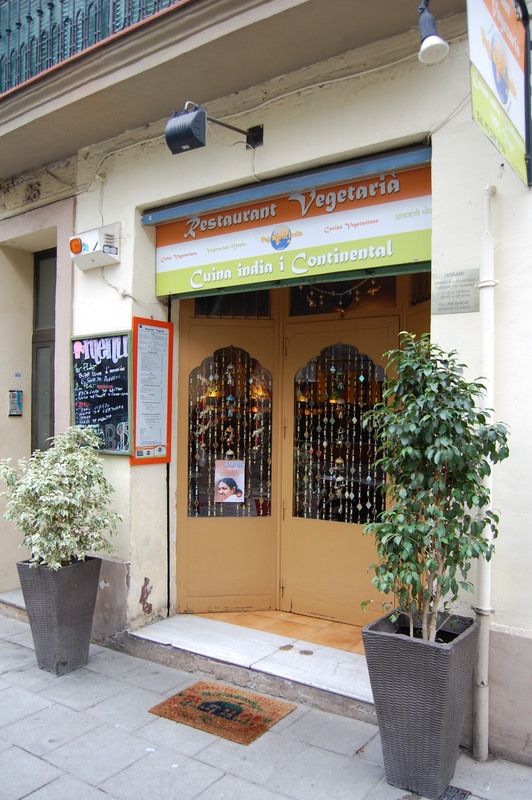 The place to go is a great little restaurant called Veg World India in Gracia. The menu offers a variety of vegetarian food from various parts of India and the restaurant boasts a 90% vegan menu. A rock solid testament to the food is the fact that I dragged a hungry carnivorous Scotsman to a 90% vegan restaurant which doesn’t serve alcohol, and he enjoyed his meal! Reasonable chaat aside, they do a super cool masala dosa! Masala dosa is an Indian style crepe made from fermented rice batter with a filling of curried potatoes. The dosa was served with a bowl of dark spicy sambhar and a little spoonful of perfect coconut chutney. Heaven. The dish is a traditional breakfast in South India and takes the best part of a day to prepare, ferment and cook. A whole day to prepare a breakfast!! My inability to put so much effort into preparing a meal myself tempers my judgement on the price. But 10 Euros for a masala dosa and 12 Euros for a paneer dosa did pinch. I didn’t order it but a plate of idlis was around 7 Euros. Ouch! Fantastic restaurant, but more of an occasional treat methinks. Damn you dosas and idlis! Why are you such hard work? * The belt and the buffaloes explained: Yes, Americans have a Bible Belt, and we have a Buffalo Belt. The Buffalo Belt of India (Primarily the states of Uttar Pradesh and Bihar and periphery areas) used to be the playgrounds of those uber cultured and hedonistic Mughal emperors. A place where art, literature and academia flourished. In more recent years though, the Buffalo Belt accounts for the highest incidence of women killed by their husbands and in-laws for not providing a large enough dowry at marriage (2008 stats put the total number of reported dowry deaths at 1210 for Bihar and 2237 for Uttar Pradesh). Delightful fellas!